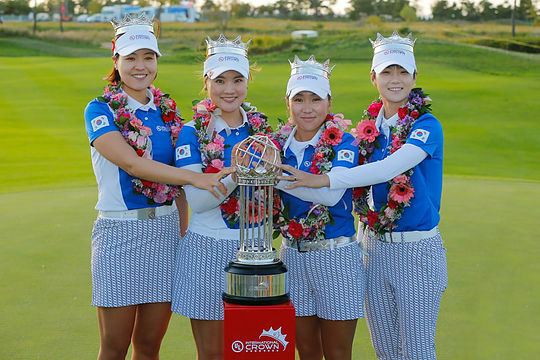 South Korea held off challenges from the United States and England to win the eight-nation International Crown for the first time in front of a home crowd at Jack Nicklaus Golf Club in Incheon on Sunday. The top-seeded host team started the final round two points clear of the chasing pack and won two of the four singles matchups to finish with 15 points, four ahead of the defending champion United States and England. South Korea entered the final day with a two point cushion and never relinquished their lead closing out a deserved four point win. Gee Chun, In-Hyung Kim, Sung Hyun Park and So Yeon Ryu would combine for 15 points for the event enough to claim the title. The final round saw South Korea drop only one point when world number one Park lost to Thai star Ariya Jutanugarn 2&1. I.K. Kim defeated England’s Bronte Law 2 up, In Gee Chun overcame Anna Nordqvist of Sweden 1 up and So Yeon Ryu shared the points with Lexi Thompson of the United States. Jessica Korda recorded the sole victory for Team US in the final round, winning 4&3 against Sweden’s Madelene Sagstrom. Michelle Wie and Cristie Kerr both lost, to Moriya Jutanugarn of Thailand and Georgia Hall of England respectively. The tournament was affected by typhoon Kong-rey which wiped out all of Saturday’s play. Thailand finished fourth, and Sweden fifth. Australia, Taiwan, and Japan were all eliminated at the end of the third round. The Australian team of Minjee Lee, Su Oh, Katherine Kirk and Sarah Jane Smith could rightly feel a little disappointed with the points format of the tournament. Despite finishing equal with England in Pool A each with seven points after three rounds of four-ball matches, Australia was relegated to third place because it had lost to England in round one. It forced the Aussies into a sudden-death playoff for the wildcard fifth final.